Getting the largest economy in the United States, that of California, to a net-zero emissions one is an incredibly ambitious goal, and one that will take a great many baby steps to achieve, among which is the aim of getting 1.5 million zero emissions vehicles on the road by 2025. And the state, which is also the world’s 14th largest carbon emitter, seems to have the means to get there, thanks in part to monies from the Golden State’s cap-and-trade program, which has funded the purchase of zero emissions drayage trucks, underwritten solar arrays for low income homes, and funded an EV car sharing pilot program for disadvantaged communities, among other projects. However, one of the most simple methods of boosting the number of zero emissions vehicles on the roads — bike sharing programs — often gets overlooked in favor of more high tech mobility solutions, which is a shame, considering the physical and mental health benefits that also come along with riding bicycles. But it looks like California might be wising up to the potential of bike sharing programs to reduce transportation emissions, while also increasing mobility options, especially in low-income communities and areas without easy access to public transit routes, and may be helping to fund bike share systems with the next round of funding for the state’s Car Share and Mobility Options program. 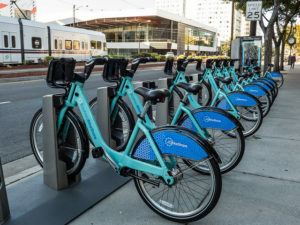 According to Next City, some $8 million in funding will be available in the second year of the California Air Resources Board (ARB) Car Share and Mobility Options project, and now cities and nonprofits will have the option to apply for money to fund bike sharing projects. Previously, only car-sharing projects were considered for funding, so opening up the application process to bike-related projects seems like a major step for the program, and one that could potentially do much more, for much less money, than auto-based projects, which have much higher costs. The details of the next round of funding from ARB have yet to be worked out, among which is getting the approval of the California state legislature, which will be deliberating the new round’s overall funding package later this summer, and ARB aims to open up the funding for applications this fall.